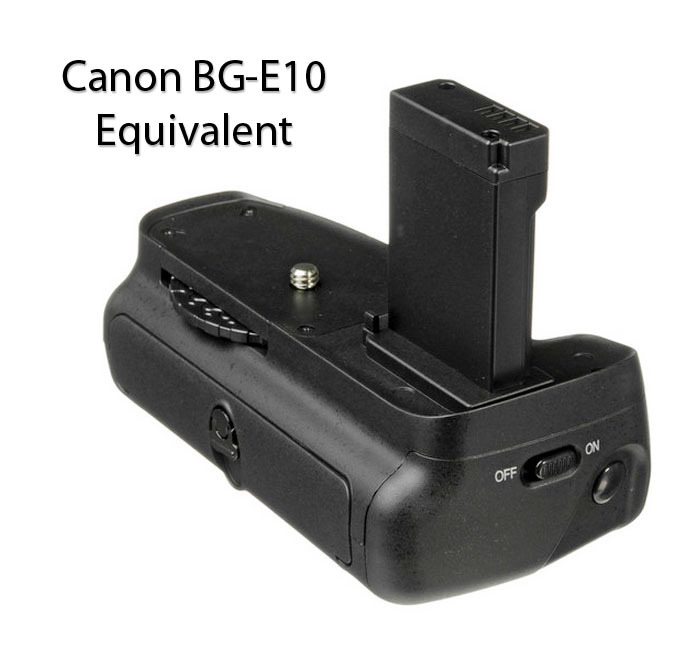 Canon actually does not make a Canon BG-E10 Battery Grip for its EOS 1100D camera. The EOS 1100D is the equivalent of the Canon T3. Instead of Canon, there are a few of the battery grips available from a 3rd party. As of the date of this article, there were 5 left on Amazon. BHPhotoVideo in New York has 3 companies offering this Canon battery grip, Bower, Vello, and Vivitar. It has a slot to store the battery compartment door so you won't lose it. This grip has the obvious shutter button for vertical photo taking. It holds either one or two of the LP-E10 Batteries. It has a place for attaching a hand strap for a snug, secure feel in your hand. It is fully compatible with the EOS 1100D - Canon T3. These battery grips are extremely light and not made of high quality materials. Heavier battery grips add a bit of a counter-weight which users comment that they feel a little more balanced when they have long lenses attached to their cameras. The biggest advantage is the increased shooting power. You can shoot for hours and hours without the worry of a dead battery in the middle of your photo shoot. The T3 shoots at 720p at 30 frames/second and extended battery life combined with a big memory card is a big plus for shooting more than just a few short video clips. Here is a really well-done, informative video on a non-Canon BG-E10 Battery Grip made by Meike purchase on Amazon in late 2012. It's not an HD video, but it's informative. Part of it shot with a cell phone, but it does a great job of showing how these economy battery grips work, how they look and feel in hour hands, as well as how to install them to work. As you can see from the video, this grip does require an external wire connection from the grip to the camera to make the vertical shutter release functional. 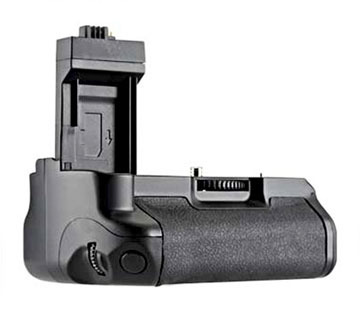 This is unlike the Canon BG-E6 and Canon BG-E8 Battery Grips where the functionality is available with built-in buttons and dials on the battery grip. Another very important Canon accessory which is more important in improving quality (as apposed by quantity) in your photography is getting a good Canon speedlite. 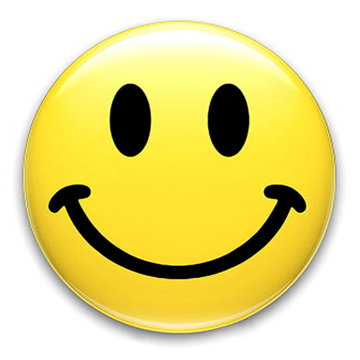 If you find information on this web site to be valuable to you, please consider visiting and perhaps purchasing from one of the retailers below. It helps me keep the Canon Geek site going.